Obesity is the product of a positive energy balance where caloric intake exceeds output, leading to fat tissue deposition. Only 5% of cases are treatable medically. 95% of cases must be treated through control of caloric intake and this is 100% reliant on what we are feeding our dogs. 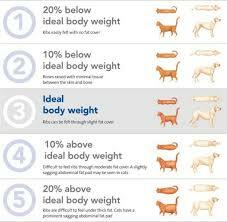 If you suspect there could be a medical cause for your pet’s obesity, particularly if the weight gain has been sudden, cannot be explained by a change in feeding or activity levels, or you have noticed other symptoms, please make an appointment with one of our vets prior to undertaking a new diet or exercise regime. Obesity without medical causes is generally always within the control of the owner. There are very few situations where a dog or cat has unlimited access to food, and of course food is almost always the main contributing factor to pet obesity, as they don’t, and shouldn’t, do enough exercise to compensate for excessive calorie intake. Giving treats to your dog, particularly as a reward for good behavior or performing tricks or tasks that you have asked for, is a very important part of the human-animal bond. Receiving treats may improve your pet’s quality of life if it is associated with positive interactions, play or reward. It is therefore important to consider the type of treats being fed. Vegetables and some fruit can make tasty treats eg. Small cubes of pumpkin, sweet potato, frozen peas, small pieces of banana or apple. Alternatively, you could save a few kibble from the morning meal allocation, and give these to the dog as a treat through the day. From personal experience, it pays to ask your pet to do something prior to receiving a treat, and to ‘schedule’ these interactions so that the dog does not learn to beg for food on their own schedule. Regular walks are great for dogs and us! It is important if your dog has been previously inactive, or has medical conditions which may impact its ability to exercise safely that you seek veterinary advice prior to increasing your dog’s activity levels suddenly. Regular play and interaction breaks the day up for your dog, and increases incidental exercise. Again for very overweight dogs, or those with respiratory or joint issues certain activities or games such as ball chasing, jumping may be dangerous so let us help you design an exercise/activity program which will be safe and effective. Toys and games which increase activity levels when you are not present are also valuable – treat balls such as Kongs for dogs (and cats) are fantastic; treasure hunts for food left in the backyard, or food mazes for playful cats are also fantastic. If your lazy cat is spending the day indoors try scattering some of his daily dry food portion around the kitchen or hallway and encourage him to move for his breakfast. One of the best toys we have found for cats is the “Da Bird’, and its off-shoot, “Da Mouse”. Call into the clinic for a demo. There are many ‘slow feeding’ products on the market, but one of the simplest is to divide your dog’s dry food into smaller portions such as in a muffin tray, then secure this to the ground. Eating slower improves mental and physical satisfaction. Please contact any of the vets or nurses at the clinic for advice tailored to your pet’s needs.